One of the main reasons I loved spring when I was in high school - aside from the cherry blossoms and the warmer temperatures - was that with the onslaught of prom season, I'd get my prom issues of Seventeen in March and April, full of pretty poufy gowns and floor-length frocks. I dreamed of looking princessy at my grad, which led me to buy two floor-length formal gowns I might never have an occasion to wear again. As of this moment, they're hanging in garment bags in an out-of-the-way closet downstairs and haven't seen the light of day in years. I don't regret the purchase because hey, how many times does the average gal get to wear a floor-length formal gown aside from her high school grad, her wedding, and maybe the occasional bridesmaid stint? However, it seems like such a waste in the long run. Budget-conscious chicas out there who want to wear their formal frock more than once may want to consider a cocktail-length dress that hits just above the knee or higher for its versatility. If you pick a flattering and relatively classic style, the dress can be worn again at formal dinners, wedding receptions, ritzy dances, out clubbing, to workplace Christmas parties...well, you get the picture. If you have the bravado and the gorgeous legs to pull it off, a cocktail dress can make you stand out in a sea of floor-length organza and taffeta. Channel Reese Witherspoon's charisma when she rocked that strapless canary yellow number at the Oscars in 2007. So, without further ado, here are some of my top picks from the Nordstrom dress shop online. I mostly picked out dresses that were on-trend and young and fresh-looking, but still classic enough to last a few seasons and be worn during cocktail hour - once you're old enough to drink, that is! I must say that i really like the Marc Jacobs "kitty" dress :). Versatile and classy yet unique. I love that one too! Probably the best out of the bunch. You can wear it at 17 or 27 and still look great. 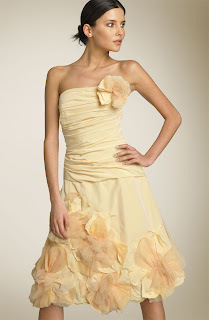 My favs are the Max Azria applique dress and the Clover halter. I think I actually saw a version of Reese's yellow dress in Le Chateau, though obviously not as fabulous.